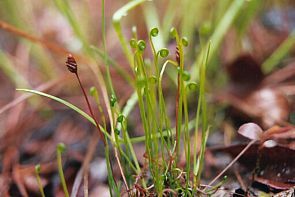 Habitat: Open damp peaty or sandy depressions shagnous bogs and low mossy open woods. Is outcompeted by too much sphagnum. Misc. : According to Stone, this plant was first discovered in 1800s at Quaker Bridge in the Pine Barrens. It attracted much interest worldwide, drawing botanists from all over to the Pine Barrens to see it. 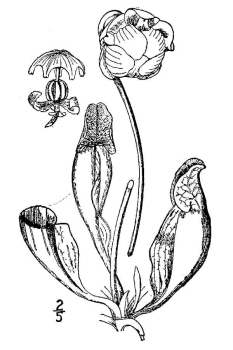 Schizaea is a disjunct population. Eflora.org reports:" It is abundant in southern Newfoundland. 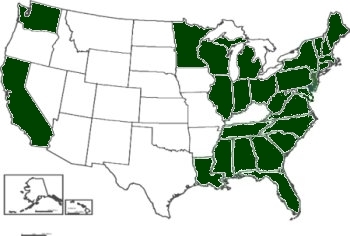 Plants from eastern Canada are shorter and denser than those from New Jersey. The same or a closely related species has been reported from Peru (R. G. Stolze 1987)." In the photograph, the brown fronds are last year's fertile fronds. The upright green fronds are this year's fertile fronds, and the curly fronds, which look like cury leaves, that are low to the ground are the vegetative (infertile) fronds. Research has shown that the gametophytes initially are negatively phototropic; i.e., they grow away from the light; and later become positively phototripic; i.e.��growing toward the light. Other research shows that the gametophytes are associated with an endophytic fungus which appears to be mycorrhizal and a second endophytic fungus which does not appear to be mycorrhizal. According to Eflora.org, " It is abundant in southern Newfoundland. Plants from eastern Canada are shorter and denser than those from New Jersey. The same or a closely related species has been reported from Peru (R. G. Stolze 1987)." Guiragossian, H. A. and R. E. Koning. 1985. Light and spore germination in��Schizaea pusilla. Bull. NJ Acad.Sci. 30: 54. Plant Physiol. 77(4): 73. Amer. J. Bot. 72: 921-922. Guiragossian, H. A. and R. E. Koning. 1984. Germination responses of Schizaea pusilla spores to light, dark, and cold treatments. Bull. NJ Acad. Sci. 29: 40. Poster: Northeast ASPP, Wellesley, MA. 1984. Kiss JZ; Swatzell LJ. 1996. Development of the gametophyte of the fern Schizaea pusilla. JOURNAL OF MICROSCOPY-OXFORD. 181:213-221. Swatzell LJ; Powell MJ; Kiss JZ. 1996. The relationship of endophytic fungi to the gametophyte of the fern Schizaea pusilla. INTERNATIONAL JOURNAL OF PLANT SCIENCES. 157(1):53-62.